DAILY SABAH – The Turkish Cooperation and Coordination Agency (TIKA) is finishing up a restoration project on the tomb of King Najashi, the former leader of modern day Ethiopia’s Kingdom of Aksum. 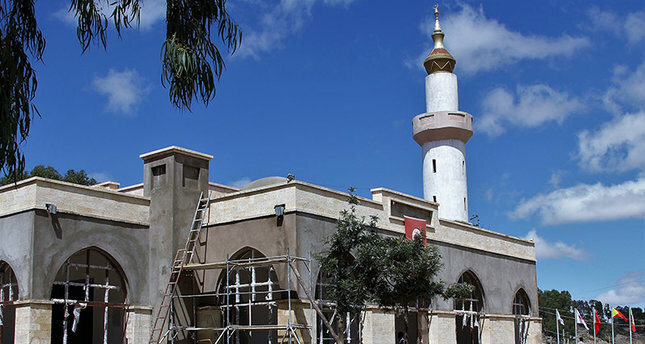 TIKA coordinator in Ethiopia’s capital Addis Ababa, Fazıl Akın Erdoğan, told reporters that the restoration project on a mosque and tomb located 800 kilometers from the capital would wrap up this year. In addition to the restorations, Erdoğan explained that additional buildings were being constructed in the area, “We made a full-fledged food court to serve the needs of the guests and visitors. Besides the kitchen, we built a multi-purpose hall that can fit 500 people,” he said. The restoration team also met the water needs of the tomb area by building 160 ton water depots in two different places. Noting that the project had been ongoing for three years, Erdoğan said that Ottoman architectural examples were evident in the marble, door, and window details of the mosque and tomb. Erdoğan emphasized that Turkey had made various negotiations with Ethiopia’s Religious Services Consultancy and that they would like King Najashi’s tomb to be added to the route of pilgrimage and umrah organizations in Turkey. If this happens, he said, the tomb would be a huge contribution to the tourism industry in Ethiopia. Imam Mohammad Ibrahim of the Najashi Mosque explained that, before the renovation works, the mosque was not in a good condition, but that everything had changed with the restoration effort. Getachew Berhe, an Ethiopian engineer who has worked on the project and speaks Turkish fluently, explained that after studying civil engineering in Turkey, he returned to his country and began working on the restoration efforts. King Najashi, also known as Armah, was the ruler of the Kingdom of Aksum from 614-631. The Empire was a trading nation situated in modern-day Eritrea and Ethopia, existing from approximately 100-940 AD. King Najashi gave shelter to early Muslims from Mecca who were seeking refuge from Quraysh persecution by traveling to Aksum, which was at time a Christian Kingdom. In Islamic history, the journey is known as the first hijra.